Irish rugby fans will be able to raise a glass to their provincial heroes next week, after being granted a special exemption to open for business on Good Friday. Publicans had sought an exemption to accommodate more than 26,000 people who will attend the Munster v Leinster rugby match at Thomond Park on 2 April. The Magners League may be sponsored by a Tipperary cider company, but as the fixture has been scheduled for Good Friday, it fell foul of laws preventing the opening of bars on the Christian holy day. District Court Judge Tom O'Donnell noted in his judgement that Limerick publicans only made the application as a last resort. Ironically, the stadium has a special licence which means that alcohol could be served inside it during the fixture. 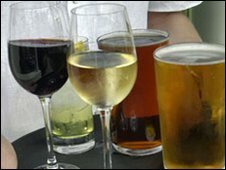 Local pubs did not benefit from this exemption and the Vintners Federation of Ireland (VFI) took the matter to court. Judge O'Donnell said it "seemed absurd" that pubs in the locality could not open for business as well. He said he was also making the ruling for health and safety reasons when so many people would be spilling out of the stadium immediately after the match. He said the pubs could stay open from 1800 GMT until 2330 GMT on the day of the fixture. The VFI welcomed the decision, but Limerick City Chairman, Jerry O'Dea said they had tried to find an alternative to resorting to the courts. "Our members saw this as a last resort having previously consulted both the Magners League and the respective teams with a view to playing the game on either the Thursday or the Saturday," he said. "We see this decision as a victory for common sense and we feel that the majority of the public supported our members in their application". An economic analysis by BDO Simpson Xavier last year revealed the average Magners League game generates between 1.2m euros and 3.5m euros for the Limerick economy, but experts believe the Munster v Leinster game is worth more than this.